Starting cornerbacks V.J. Banks and Rashad Ajayi at practice. Credit: Rich Kurtzman. Welcome to Fort Collins, K.J. Carta-Samuels. 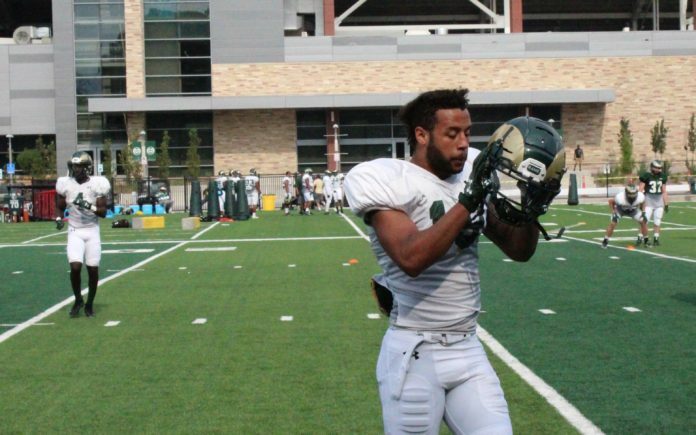 Without a doubt, the most anticipated player for the Colorado State Rams football team this year is Carta-Samuels, who is officially the starting quarterback. 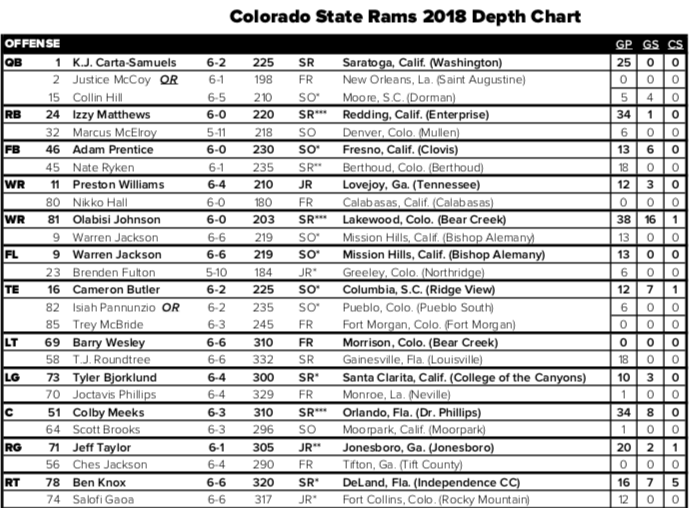 That, according to the Rams’ first depth chart of the season, which was released on Saturday, one week before CSU hosts Hawaii on Aug. 25, at 5:30 p.m. MST. 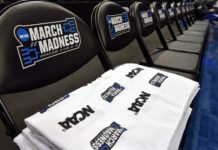 Carta-Samuels, a graduate transfer from Washington, was expected to be asked to step in and start immediately due to the second ACL injury in less than two years for Collin Hill. Carta-Samuels, who came to the team in only May, has worked incredibly hard to learn Mike Bobo’s offense as well as his teammates. He’s also looked accurate in practices and the first fall scrimmage of the year, even if his second scrimmage left a lot to be desired. On the offensive side of the ball, there weren’t any surprises in terms of starters. Izzy Matthews is the starting running back, although it’s a bit surprising Marcus McElroy is listed at No. 2 instead of Rashaad Boddie or Marvin Kinsey, who have each excelled this summer. On the newly assembled offensive line, freshman Barry Wesley will start at the important left tackle position, earning a scholarship this summer due to his wonderful work ethic. While Wesley is the one freshman starter on offense, there are two on the defensive side of the ball. Devin Phillips, who came to Fort Collins at 6’1″ and 318 pounds, will start at nose tackle over JuCo transfer Damion Dickens. Phillips gives the Rams much-needed size up front and an ability to clog up holes in the run game. Also on that line is Emmanuel Jones, a sophomore who Bobo’s been high on since last year. Jones earned one start in 2017, and now he’s in line to start all season long at left defensive end. In the team’s second scrimmage of the fall, Jones recorded a sack and again impressed his head coach by creating pressure, which will be key for that defensive line this year in the 4-3. And outside, it’s freshman Rashad Ajayi starting over junior Anthony Hawkins, which is maybe the biggest surprise of the entire first depth chart. Ajayi has practiced very well, playing physically from his cornerback spot, even against the much taller Warren Jackson, who stands at 6’6″. Hawkins was moved over to cornerback from receiver in 2017 and really struggled early on, but improved week-by-week and was the likely starter before Ajayi came in and delighted his coaches to be named the starting right corner. 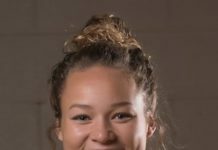 Opposite of Ajayi is yet another newcomer to the Rams in graduate transfer V.J. Banks, formerly of Rice. 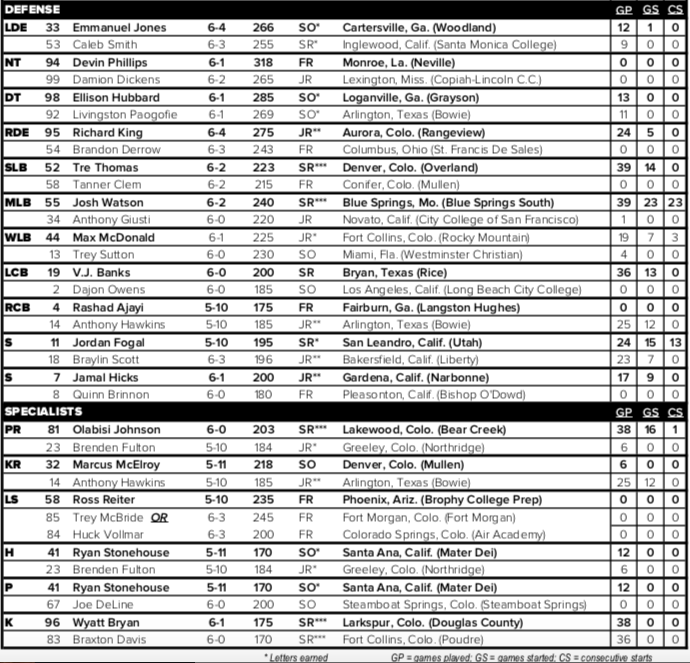 Banks and Ajayi will start on the corners, while Jordan Fogal and Jamal Hicks are the starting safeties on what is likely the deepest defensive backfield in many years in Fort Collins. On special teams, McElroy is listed as the team’s kick returner, which is a bit shocking considering he weighs in at 218 pounds. The Rams seem to be searching for a consistent kick return man year after year and it will be interesting to see what McElroy can bring to kickoffs.